Note angular shape and dark brown color of lesions and petiole damage of Bacterial Blight. Foliar Symptoms: Symptoms of Bacterial Blight start as tiny water-soaked spots, and progress into characteristically angular shapes due to leaf veins limiting bacterial movement. 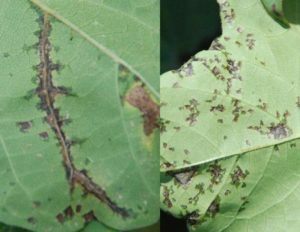 Lesions appear on the upper side of the leaf, turn black as they expand, and defoliation may occur. Systemic infections follow the main veins as black streaks; symptoms on the bolls are characteristically sunken, water-soaked lesions. Diagnostic Note: Lesions are typically dark brown (darker than many other pathogens) and can be “shot-hole” in appearance when necrotic tissue falls away. Observe the underside of the leaf for water-soaking around the lesions. 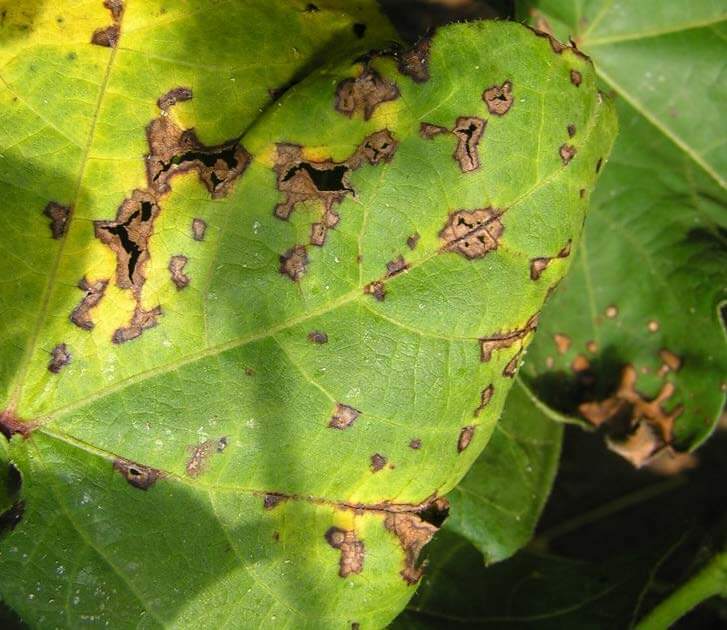 Range and Yield Loss: Bacterial Blight is a major disease of cotton. 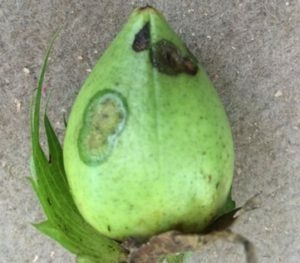 Since acid delinting of cottonseed in the U.S., Bacterial Blight has been rare, except in OK and TX; however, there is a recent resurgence in additional states. Yield loss can be severe, up to 20%, depending on variety and pathogen race. Resistant cultivars are the most economical option to minimize yield loss. Incorporation of infected residue into the soil will help with decom-position of infected debris and reduce inoculum in the soil. Sunken lesions resulting from Bacterial Blight.